Initially announced as Surface for Windows 8 Pro on June 18, 2012, Microsoft later renamed the device to Surface Pro.The touch-screen for this device is a fused/bonded unit so replacement screens are the full Digitiser/LCD assembly. Mountain Stream Ltd can replace your touch-screen and return your repaired MS Surface 2 quickly and cost effectively. We can arrange free collection and return of your MS Surface Pro in RG1, RG2, RG4, RG5, RG6 and parts of RG7, RG10,RG30 & RG31 (depending on distance). FOR OTHER MICROSOFT SURFACE PRO REPAIRS PLEASE CONTACT US FOR A QUOTE. 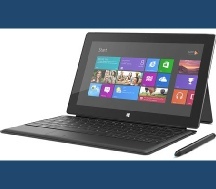 For all other MS SURFACE PRO repairs please call or use our enquiry form for a quotation.